*The morning began with coffee at The Bean with sister Christy and our friend April Muhs. (I have three close friends named April. She is April #3). We went through a variety of subjects including the local library, blogging, and how we organize things in our homes. I use tote bags. Christy uses three ring binders. April uses clip boards. We decided whatever works, go for it!! *Brother Bill came in around 9:30 a.m. to have Christy and I sign some papers regarding the closing of Mom’s estate. Once Mom’s tax refund check comes in, all things should be ready to close out. *From about 10 to 4 p.m. I was in creative heaven. Rachael Clark-Krusemark, the KHS art teacher, let me know she was holding open studio in her art room today, and I could come up and do some ceramics, since I had a half a slab of clay left from last year, when I tried my hand at throwing pottery. 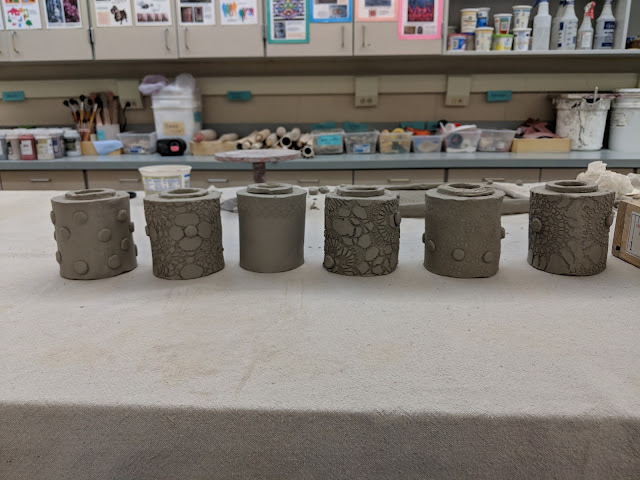 I didn’t enjoy throwing pottery as much as building pottery, so I came with some ideas, and ended up creating six tea mugs with no handles and a tray for them go sit on. Each mug has a different design, but are connected by raised dots on each of them. I used some doilies and lace that I brought, and that Rachael had in her room, to create the patterns on the mugs and the tray. Here is what they look like while they are still wet. Monday after school I will go up, clean them up a bit, and then they will dry and get fired. Once they are fired, then I will chooses different glazes to paint them with. I am very excited for this project to be done. I may get some more clay and create some more pieces before the end of the year!! *When I returned home, I received a text from Bill saying Adrienne was engaged to her boyfriend Josh. This was great news, and it was very exciting that they announced it when Debbie was there in New York visiting Adrienne and her son Jack. *During the evening I spend time trying to correct some flaws in the shawl I am knitting. It is very frustrating, because I am still finding things wrong. But I will prevail! *Paul wanted to watch an action-adventure film, so we found the remake of The Magnificent Seven online and watched it. Well, Paul watched it. I kind of listened while grappling with my yarn project. But I did pay attention at the end when they had the big showdown.